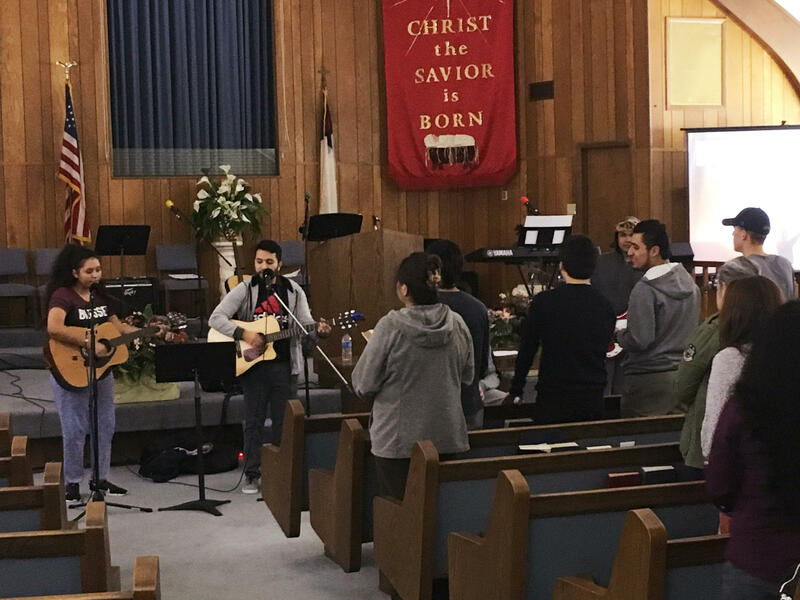 Young worshippers at Erez Baptist Church in Duncanville, Texas, gather for a midweek music service. The congregation, less than a year old, consists almost entirely of Hispanic immigrants and their children. "Everything we do is about making disciples," says the Rev. Roland Rodriguez, who founded the Erez congregation in December 2016. The contrast between the two congregations is emblematic of broader changes in U.S. Christianity. With the number of Americans who do not attend church or identify with any organized religion increasing, immigrants are accounting for a larger share of the Christian population. "This is the fastest-growing element of American Christianity, across the board," says the Rev. Samuel Rodriguez, president of the National Hispanic Christian Leadership Conference. "[Whether in] Catholicism, evangelicalism, mainline denominations, if you're a follower of Christ, you want to embrace the immigrants." The increased dependence on immigrants to fill U.S. church pews means that Christian leaders have a big stake in the current debate over immigration policy. While many cite the biblical instruction to welcome the stranger, some have a more existential concern for supporting a generous approach: Without immigrants, they fear the U.S. Christian church may not survive in its current form. "Mass deportation of current immigrants would do nothing less than cripple American Christianity for generations to come," says Samuel Rodriguez, who prayed at President Trump's inauguration. "If you deport the immigrants, you are deporting the future of Christianity." According to surveys by the Pew Research Center, one-fourth of all U.S. Catholics are immigrants. An estimated 40 percent of Eastern Orthodox Christians in the United States were born outside the country. Even the Episcopal church, one of the whitest and most traditional of the Christian denominations in the United States, is seeing an influx of immigrant worshippers. The concern over immigrant Christians is especially acute among evangelicals, who place great importance on "church planting," the establishment of new congregations from scratch. For Roland Rodriguez, the founder of Erez Baptist, it's a specialty. Over the past 20 years, he has founded or "planted" more than a dozen new congregations in Texas. With that experience, he is now director of Hispanic Ministries for the Texas Baptist Convention. "The convention is not asking me, 'You have to plant churches,' " Rodriguez says. "I do it because it's my calling." Over the years, he has established a routine, which he now follows carefully. "No. 1, find my core group — two, three families," he says. He then trains them in church leadership and looks for a place to hold worship services, prayer groups and other activities. And then he sets out to raise some money. "To plant a church, you need funding," he says. "You need resources." Having put Erez Baptist on relatively firm footing, Rodriguez (no relation to Samuel Rodriguez) is already preparing to plant another church. Now 52, Rodriguez and his parents arrived in the United States from Mexico in the early 1980s without permanent visas and won legal residency status only as a result of the amnesty provisions in the 1986 immigration reform. Now working almost exclusively with immigrants, Rodriguez thinks their experience coming to the country leaves them especially open to the evangelical Christian message. "When they come and see that somebody is lending a hand when they need it the most, they become very receptive to the Gospel," he says. "It's a great opportunity for us not just to tell them about Christ but show them." Many Hispanic immigrants come from a Catholic background, and Catholic parishes in Texas and across the country have also welcomed the newcomers. "In times of crisis, we become much more acutely aware of our needs, and immigration is a time of crisis," says Bishop Michael Olson, who heads the Diocese of Fort Worth, Texas. "When coming to a new nation, it is very important and critical that people find safety and something familiar so they can encounter God and their neighbor." But if immigrants need churches, it's also true that churches need immigrants. Not surprisingly, the prospect of increased immigration restriction can be unsettling to Christian leaders. The Trump administration is ending large parts of the temporary protected status program, which has offered temporary residence to people fleeing violence or natural disaster. The termination of the program will affect more than 200,000 immigrants from El Salvador and other troubled countries. In addition, the failure by the White House and Congress to agree on a way to protect the "DREAMer" immigrants who have benefited from the Deferred Action for Childhood Arrivals program could mean that at least 700,000 people could face deportation. And Trump also wants to step up efforts to find and deport other immigrants who have arrived in the country illegally. "If you round people up and get mass deportations, combined with TPS expiration and no DACA deal, it would have a massive, massive immediate impact," says the Rev. Tim Holland, who leads a nondenominational bilingual church in Grapevine, Texas. Holland's church actually has two congregations: one for English speakers, organized as LifeChurch, and one for Spanish speakers, organized as Mundo de Fe. The combined membership is about 3,000, but Holland says only about 400 come for the weekly English services. That immigration debate in Congress this week is being followed closely by Christian leaders who say their churches could not survive without immigrant worshippers. NPR's Tom Gjelten has more. TOM GJELTEN, BYLINE: Fairmeadows Baptist Church on the south side of Dallas, Texas, was on the verge a year ago of going out of business. As few as a dozen people were showing up each Sunday. But then a new group arrived and asked to rent the church for their own worship services. Their congregation is now thriving. ELIA ARRIAGA: Father, we want to serve you. Use us as instruments, Father, to honor you and glorify you, Father. And as we pray, Father..
GJELTEN: Each Wednesday night, several of the people who founded the new congregation gather at the church to pray together. Elia Arriaga is among them. All are Hispanic, immigrants or the children of immigrants. When they pray, they go back and forth between English and Spanish. GJELTEN: Pastor Rolando Rodriguez organized the congregation, which now has about 30 families. This is what's called a church plant, a congregation organized from scratch. Church planting is a Rodriguez specialty. He has started more than a dozen in the last 20 years. He now coordinates Hispanic ministries for the whole Texas Baptist Convention. R. RODRIGUEZ: The convention is not asking me, well, you have to plant churches. I mean, I do it because that's my calling. GJELTEN: Rodriguez says it takes him about six months to get a new congregation up and running. He follows a step-by-step process. R. RODRIGUEZ: Number one, to find my core group - two, three families - to train them, to find a place, to raise some money because a church plant - you need funding. You need resources. GJELTEN: This is how faith spreads. New churches get established, and then they grow. And in America, it's immigrants - Hispanic immigrants in particular - who are leading this movement. Across Texas, Rodriguez says, between a quarter and a third of new Baptist churches have been founded by Hispanic immigrants. R. RODRIGUEZ: When they come and when they see that somebody is lending a hand when they need it the most, you know, they become very receptive to the gospel. And this - it's a great opportunity for us to not just tell them about Christ but show them. GJELTEN: The phenomenon is evident across Christian denominations. The Pew Research Center says about 40 percent of Eastern Orthodox Christians in the U.S. are immigrants, as are one-fourth of all U.S. Catholics. Bishop Michael Olson leads the Diocese of Fort Worth, Texas. MICHAEL OLSON: In times of crisis, we become much more acutely aware of our needs. And immigration is a time of crisis. Coming to a new nation, it is very important and critical that people find safety and something familiar so they can encounter God and their neighbor. GJELTEN: But if immigrants need churches, it's also true that churches need immigrants at a time when church affiliation among the U.S.-born population is declining - thus the alarm among Christian leaders over the absence of an agreement to protect those immigrants known as DREAMers. And then there is the Trump administration plan to return as many as 300,000 immigrants who have fled violence or disaster and step up deportation efforts in general. SAMUEL RODRIGUEZ: Mass deportation of current immigrants in America will do nothing less than cripple American Christianity for generations to come and, arguably, in a definitive manner. GJELTEN: Samuel Rodriguez is president of the National Hispanic Christian Leadership Conference. When you deport immigrants, he says, you are deporting the future of American Christianity. S. RODRIGUEZ: This is the fastest-growing element of American Christianity across the board - Catholicism, evangelicalism, mainline denominations. If you're a follower of Christ, then you would want to embrace the immigrants. GJELTEN: Rodriguez is one of about a hundred Christian leaders who last week signed a full-page ad in The Washington Post advocating a generous immigration policy. They cited the biblical instruction to love one's neighbor. But their concern is also existential. Without immigrants, they fear the U.S. church as we know it may not survive. Tom Gjelten, NPR News. Transcript provided by NPR, Copyright NPR.